The next version of Android isn't ready or even properly named yet, but Google has kindly released a Developer Preview of the software so anyone bold enough can take a look at what it offers. All you need is a spare Nexus 5 or 2013 Wi-Fi Nexus 7 that you don't rely on, and the instructions we've laid out below. It's worth emphasizing that this is an early, buggy, developer preview—you risk seriously messing up your device and losing any data it holds, so make sure photos, music and so on are well backed up before you get started. Android L itself appears stable enough, but many of your favorite third-party apps won't yet be compatible with it and may throw up errors. In other words, don't install Android L on a device you need every day. Our guide below uses Windows 8.1, but the process on other OSes is similar. You're going to need three downloads from the Web, some of which you may already have if you've dabbled in Android rooting and modifications before. First of all, find the system image you need for your Nexus 5 or Nexus 7 from the the official download page. In this guide, we're using the Nexus 7 "Razor" version, which weighs in at 422MB. Keep this in a safe place on your system. Then you're going to need the Google USB driver for Windows. You may have attached your phone or tablet to your PC before, but these specialist drivers enable you to do more than just copy over music and photos. Finally, you're going to need the Android SDK kit, which you can unpack in a folder of your choice—just remember where that folder is. On your Nexus device, open Settings then choose About phone/tablet. Tap the Build number seven times to activate the Developer options entry on the Settings screen, then go back and select it. Switch on USB debugging, which enables you to swap out the device's operating system, among other functions. Plug your phone or tablet into your computer and make sure it's connected as a camera device (PTP) rather than a media device (MTP)—you should be able to do this from the drop-down notifications drawer. If you see a confirmation message asking whether to allow USB debugging, choose OK.
Update the relevant Windows drivers using the Google USB driver we downloaded earlier. Perhaps the easiest way to do this is to launching Device Manager from Control Panel, right-click on the Android device entry and choose Update Driver Software. Opt to Browse my computer for driver software when the option appears to point the installer to the driver package you've saved from the Web. With these steps done you're ready to launch the Android SDK and begin installing the Android L software on your device. The .tgz archive file you've saved to disk holds another archive file in the .tar format. Use a tool such as 7-Zip to extract the individual files in this second archive to the platform-tools folder contained within the location where you've placed the SDK kit. These files include the device image itself and the routines required to install it. Open this platform-tools folder in File Explorer, hold down Shift and right-click inside it. Choose Open command window here from the menu to bring up the command prompt. Type adb devices and hit Enter to see if your Nexus device is available — if nothing is shown under the list of attached devices, you've gone wrong somewhere. Retrace your steps to troubleshoot the problem, checking drivers, USB debugging and USB mode. If your device is shown, switch it off then hold down the power and volume down buttons to get it into bootloader mode (which will show a list of device specs and an open Android robot on the screen). Alternatively, type adb reboot bootloader to do the same job. This mode gives us access to the system software, but the device still needs unlocking, unless you've gone through the process before—type fastboot oem unlock to do this. You'll need to confirm your decision on the device itself, signalling your intention to live on the cutting edge of Android development. All that's left to do is install Android L. Type flash-all.bat in the command window to run the small script that flashes the new operating system to your device. This process can take some time—and the very first boot-up is a lengthy one too—so be patient while the upgrade is being carried out. 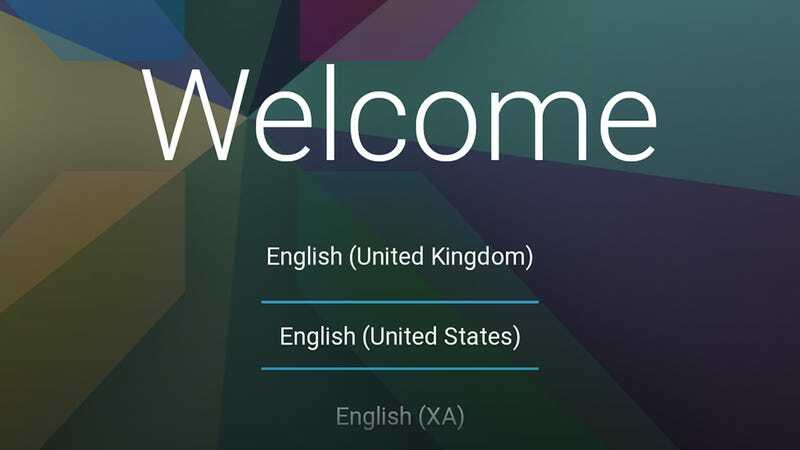 All being well, the Android L setup process should appear on your device's display and you can get started—we worked through the above process on a new Nexus 7 in about 45 minutes—but every computer has its own quirks and variations in the way it's configured. If you do run into any problems, rebooting both computer and device and repeating the flash process can be enough to iron them out. Web searches and forum crawling can often turn up suggestions and tips from other Android users trying to run through exactly the same procedure that you are. If you need to get back to the stock version of Android, you can go through the same process again using the factory images provided by Google.